Amy Miseli, here teaching map and compass skills to Cub Scouts, plans to attend the BSA Boot Camp. A Western Washington chapter of the Boy Scouts is preparing to welcome girls to scouting with a "boot camp" just for teenage girls this coming weekend. The idea behind the two-night campout is to familiarize girls with scouting skills and prepare them for leadership. As of next year, the Boy Scouts will establish separate all-female and all-male troops. The BSA Boot Camp takes place at Camp Thunderbird outside Olympia from October 5-7. This first of its kind event is being hosted by the Pacific Harbors Council. 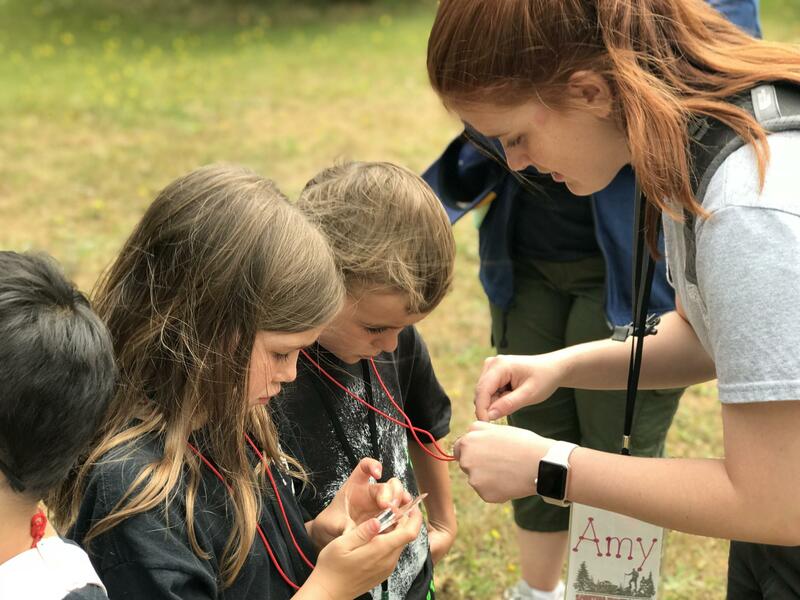 Scout leader Amanda Lafferty of Puyallup says knot tying, fire building, and camp and patrol set up are just some of the things on the agenda. "We have all of these girls that are about to come into scouting and we didn't want to throw them straight into a troop and not be ready," Lafferty said in an interview. Lafferty said around 40 girls had signed up for the boot camp as of last Friday. The event comes almost a year after the directors of the national Boy Scout organization voted unanimously for inclusivity. This summer, young girls began participating in Cub Scouts (ages 5-10) in the Northwest and nationwide. Cub Scout packs are now designated for boys, girls-only or for both sexes. When the Boy Scouts are integrated, they will not have mixed gender troops. Older girls between the ages of 11-17 can join the Boy Scouts beginning next February. At that time, the Boy Scouts of America plans to drop "boy" from its namesake program and re-brand it as "Scouts BSA." "It's been overwhelmingly positive," said Lafferty about the reaction she perceives to the Boy Scouts opening their ranks to girls. "Everyone is busier than ever these days. People don't have time to spread ourselves amongst multiple different organizations. It made our lives easier to be part of one organization." Lafferty said her two boys are both Boy Scouts, her younger daughter is now a Cub Scout and both she and her husband are scout leaders. Boy Scouts of America has long offered a coed program called Venturing for teenagers, but the youth-led, outdoor activities crews have much smaller participation than the better known Boy Scouts. Venturing evolved out an earlier program for senior scouts called Explorers. 10/2 Editor's note: This story has been updated to clarify that the Boy Scouts will accepting girls for all-girl troops next year, separate from the all-boy troops.